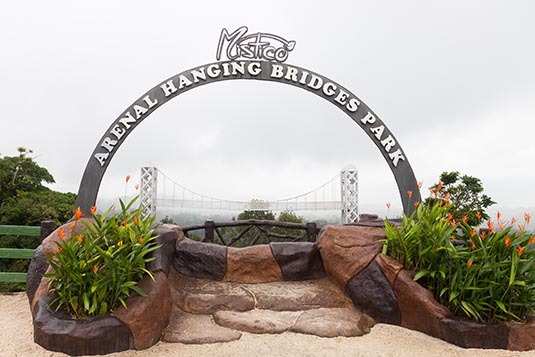 The history of Mistico Park, home to Costa Rica’s famous hanging bridges, began at the beginning of the 20th century. Spouses Landelina Rodriguez Sanchez and Adrian Castillo, who were natives of La Fortuna, San Carlos, dedicated their time to working the land they had inherited from their parents in the foothills of the Arenal Volcano. 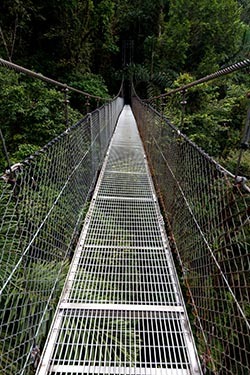 We drove for a couple of hours from La Paz Waterfall Gardens and checked in Tabacon Thermal Resort, nestled a few kms. away from the town of La Fortuna. We would be here for 2 nights. The resort is set on more than 900 acres of lush tropical reserve, home to Costa Rica’s largest network of naturally flowing hot springs. In the late 1980s, Costa Rican born Jaime Mikowski fell in love with a property at the base of the majestic Arenal Volcano, where a stream of hot springs ran through a marsh and grasslands. He convinced the local owners to sell him a share of the company that owned the land and spent the next few months persuading friends to invest with him on a wellness spa concept developed around the idea of a natural encounter. Today, Tabacon offers 103 luxurious guest rooms and suites; two restaurants; four bars and a world-class spa; which has free access to its guests from 8AM to 10PM. That evening we relaxed at the spa. The next morning we were ready to explore the hanging bridges. Our guide Karla was in her elements whilst leading us through a 3.2 km trail that had 15 bridges; 6 of them hanging. The bridges allowed visitors to enjoy the forest’s beauty comfortably and safely. 3 hours well spent. We also had the option to hike the famous Arenal Volcano. But opted out. Instead, we chose to visit the quaint little town of La Fortuna. We were allowed 2 hours to explore the neighbourhood and have lunch as well. The rest of the evening was at the spa. The next morning we would leave for Villa Blanca Cloud Forest.